Sometimes, loved ones worry when you don’t answer their calls. They might imagine that you’re ill or that something bad has happened. This can be extremely distressful! 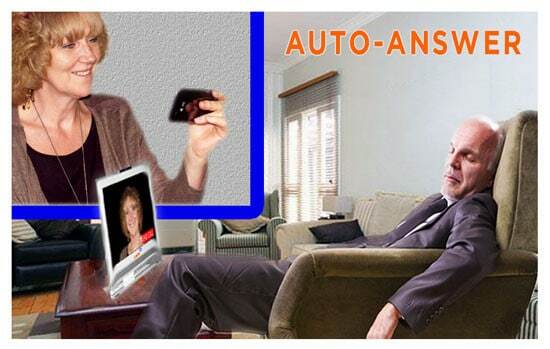 An Auto Answer Phone with 2-way video can help. We can setup your Konnekt Videophone to answer incoming calls automatically, if you don’t reach the Videophone in time, from ONLY the authorised callers that you nominate. You can even choose how long it takes to automatically answer. So your trusted relative or friend can be re-assured – whether you’ve taken too long to answer, if you’ve fallen asleep during a movie, if you have the cat on your lap, if you’re busy with dinner or if you’re in the next room. Your child or care-giver can check whether you’re OK or need assistance. When Videophone auto-answers, you can BOTH SEE and TALK to each other. It’s loud, and picks up your voice even if you’re in a nearby room but can’t get up. You can SEE who is calling so — unlike a webcam — you can be reassured that it’s a contact you’ve nominated. We set up Videophone to ONLY auto-answer those trusted contacts that you nominate. Unlike other solutions, your other contacts are not auto-answered. Auto-answer is optional and not recommended if your Videophone is in a bedroom. For care providers and family, Konnekt’s customized Auto Answer Video Phone feature is a godsend. How does it help those with dementia, Alzheimer’s, acquired brain injury, a learning difficulty or a past stroke? The Konnekt Videophone is INCREDIBLY SIMPLE — easier than a phone or TV — with one-touch call buttons. It reinforces the link between names, faces and voices. There are no numbers to remember, no keyboard or mouse, no logins or password, no handset. No computer skills are required, whatsoever. It can cleverly avoid voicemail, it blocks telemarketers and fraudsters, and nominated care-givers can be auto-answered. We do installation, Internet, setup, customization and full support. Visit Dementia applications, or see our Konnekt Disability Videophone designed specifically (and with additional features) for those with a cognitive impairment.